Restaurant "Platan", Restaurants of Uzbekistan, Restaurants of Samarkand, It is interesting, Tours to Uzbekistan. 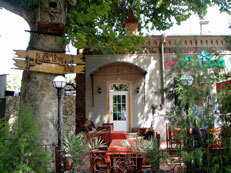 The restaurant «Platan» is situated in the centre of Samarkand. Interior, music, entertainments create a harmony of soul and body, filling you with positive emotions. Thanks to the unusual atmosphere of the restaurant, you can relax and relieve fatigue. Restaurant chiefs will surprise you with tasty, fresh and various dishes prepared not only in the kitchen but also in the open air. Restaurant “Platan” is situated in a picturesque and secluded place, which attracts tourists. Address: Pushkin Street, 2, Samarkand. Working hours: from 10.00 am till 01.00 pm. Recommended dishes: shashlik, grilled chicken, pork ribs, fahitos and beef with black sause.